The Palace of Westminster is the meeting place of the House of Commons and the House of Lords, the two houses of the Parliament of the United Kingdom. 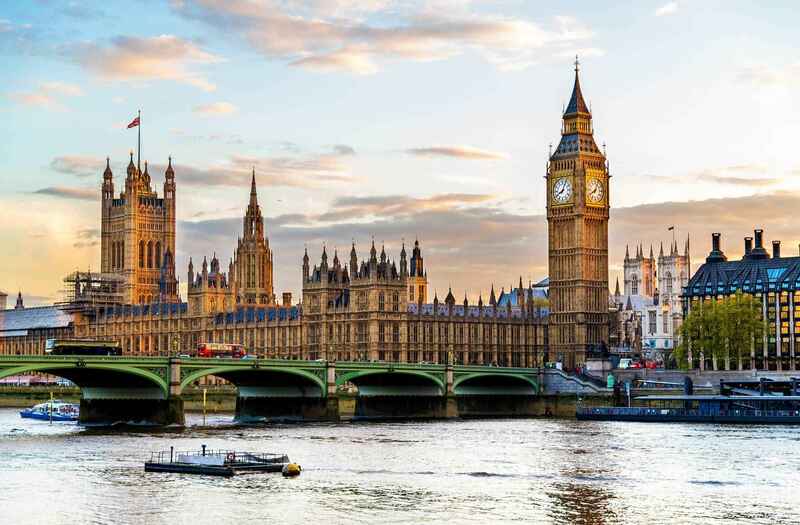 Commonly known as the Houses of Parliament after its occupants, it is also known as the 'heart of British politics'. The Palace lies on the north bank of the River Thames in the City of Westminster, in central London. Its name, which derives from the neighbouring Westminster Abbey, may refer to either of two structures: the Old Palace, a medieval building complex destroyed by fire in 1834, and its replacement, the New Palace that stands today. The palace is owned by the monarch in right of the Crown and, for ceremonial purposes, retains its original status as a royal residence. The building is managed by committees appointed by both houses, which report to the Speaker of the House of Commons and the Lord Speaker. The Palace of Westminster features three main towers. Of these, the largest and tallest is 98.5-metre (323 ft) Victoria Tower, which occupies the south-western corner of the Palace. Originally named "The King's Tower" because the fire of 1834 which destroyed the old Palace of Westminster occurred during the reign of King William IV, the tower was an integral part of Barry's original design, of which he intended it to be the most memorable element. The architect conceived the great square tower as the keep of a legislative "castle" (echoing his selection of the portcullis as his identifying mark in the planning competition), and used it as the royal entrance to the Palace and as a fireproof repository for the archives of Parliament. Victoria Tower was re-designed several times, and its height increased progressively; upon its completion in 1858, it was the tallest secular building in the world. At the base of the tower is the Sovereign's Entrance, used by the monarch whenever entering the Palace to open Parliament or for other state occasions. The 15 m (50 ft) high archway is richly decorated with sculptures, including statues of Saints George, Andrew and Patrick, as well as of Queen Victoria herself. The main body of Victoria Tower houses the three million documents of the Parliamentary Archives in 8.8 kilometres (5.5 mi) of steel shelves spread over 12 floors; these include the master copies of all Acts of Parliament since 1497, and important manuscripts such as the original Bill of Rights and the death warrant of King Charles I. At the top of the cast-iron pyramidal roof is a 22 m (73 ft) flagstaff, from which flies the Royal Standard (the monarch's personal flag) when the Sovereign is present in the Palace. On all other days the Union Flag flies from the mast. At the north end of the Palace rises the most famous of the towers, Elizabeth Tower, commonly known as Big Ben. At 96 metres (316 ft), it is only slightly shorter than Victoria Tower but much slimmer. It houses the Great Clock of Westminster, built by Edward John Dent on designs by amateur horologist Edmund Beckett Denison. Striking the hour to within a second of the time, the Great Clock achieved standards of accuracy considered impossible by 19th-century clockmakers, and it has remained consistently reliable since it entered service in 1859. The time is shown on four dials 7 metres (23 ft) in diameter, which are made of milk glass and are lit from behind at night; the hour hand is 2.7 metres (8 ft 10 in) long and the minute hand 4.3 metres (14 ft). Elizabeth Tower was designed by Augustus Pugin and built after his death. Charles Barry asked Pugin to design the clock tower because Pugin had previously helped Barry design the Palace In the 2012 BBC Four documentary, Richard Taylor gives a description of Pugin's Clock Tower: "It rises up from the ground in this stately rhythm, higher and higher, before you reach the clock face, picked out as a giant rose, its petals fringed with gold. Medieval windows above that and then it hits the grey slate roof, its greyness relieved by those delicate little windows again picked out in gold leaf. And then rises up again in a great jet of gold to the higher roof that curves gracefully upwards to a spire with a crown and flowers and a cross. It's elegant and grand and has fairy tale qualities." The Chamber of the House of Commons is at the northern end of the Palace of Westminster; it was opened in 1950 after the Victorian chamber had been destroyed in 1941 and re-built under the architect Giles Gilbert Scott. The Chamber measures 14 by 20.7 metres (46 by 68 ft) and is far more austere than the Lords Chamber; the benches, as well as other furnishings in the Commons side of the Palace, are coloured green. Members of the public are forbidden to sit on the benches. Other parliaments in Commonwealth nations, including those of India, Canada, Australia and New Zealand, have copied the colour scheme under which the Lower House is associated with green, and the Upper House with red. 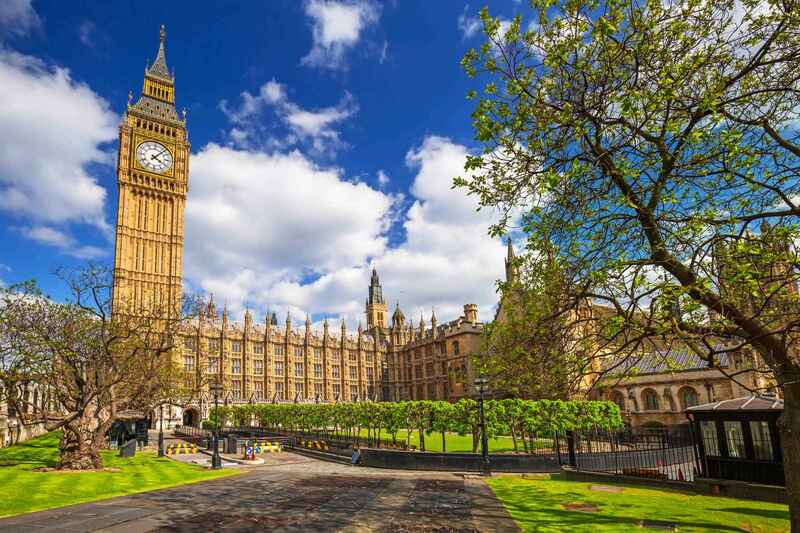 Palace of Westminster | eTips Inc.